Situated on the south west coast of France, in the gorgeous Aquitaine region, the Bay d'Arcachon sits alongside the huge Gascogne Regional Natural Park, with Bordeaux just an hour away, and Toulouse at daytrip distance (3 hours by car). Bassin d'Arcachon is surrounded by the ten towns of Arcachon: Le Teich, Gujan-Mestras, La Teste-de-Buch, Biganos, Audenge, Lanton, Andernos-les-Bains, Arés and Lège-Cap-Ferret, with the sparsely inhabited Isle of Oiseaux in the centre of the bay itself. The bay provides sheltered seaside holidays in the stunning French climate with wild natural landscapes, perfect for walking, cycling and boat trips. Nestled within the arm of Lège-Cap-Ferret, the bay is peaceful and protected. From the bustling town of Arcachon to the peaceful sanctuary of Le Teich, and pretty forests of Biganos, the Bay is surrounded with fantastic things to do and see. Madame Vacances offers apartments in Le Teich, just 300m from the sandy beach and on the fringe of the bird sanctuary. The area around the bay is populated with good walking paths and trails. Whether you're looking for a full-day excursion, a strenuous hike or a casual stroll to take some photos, the warm sunshine and pretty landscapes will win you over. There's a particularly nice walk from Le Teich to the Leyre delta, which leaves from the bathing pool in the village, winding past the bird sanctuary, through the salt marshes, which is just under 4 miles in total (one way). If you fancy hopping on a bike, there are plenty of bike rental shops around the bay, with two in Le Teich itself. The area surrounding the bay offers more than 124 miles of cycle paths, with two lovely trails around Le Teich, taking from 2 hours to half a day. 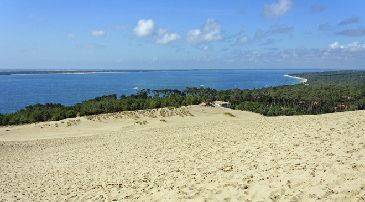 Bassin d'Arcachon offers two kinds of beach, on the ocean side, and within the bay itself. Naturally the beaches within the bay are more sheltered, suitable for families and young paddlers. Many of the beaches are also supervised in the summer months, so you can relax safe in the knowledge your little ones are playing in safety. With such beautiful, protected water, it would be a shame not to make the most of it during a Bassin d'Arcachon holiday! If staying dry is important, hop on a guided motorboat or yacht trip around the bay. The boats on the bay are beautiful classic wooden crafts, meticulously maintained to provide gorgeous trips out. For something higher octane, the bay is the perfect time to finally learn to surf, windsurf, water ski or wakeboard. There are also stand up paddle lessons, plus body boarding and canoeing or kayaking. Youngsters will not get bored in Bassin d'Arcachon, with five amusement parks in the area alone. Head to Aqualand for slides and water rides galore, or Bassin Aventures for monkeying around in the tree-top rope course. La Coccinelle is perfect for toddlers who enjoy feeding the animals, while Max'Golf will have them practising their swing at mini golf. As well as La Coccinelle, the Zoo du Bassin d'Aracachon is perfect for kiddies to meet the animals, from red pandas and leopards to lemurs and parrots. When there's unbounding energy to be burned, the karting track, laser zone and paintball will entertain teens. For a fun-filled day on the beach, most of the beaches surrounding the bay offer kids' clubs, with activities and safe supervision. The Aquitaine region is well known for its delicious local produce and delectable fine wines. With Bordeaux just round the corner, you can be sure of a good glass or two here. Oysters are a speciality, eaten raw out of the shell, with a little lemon and seasoning. For self-catering holidays, there are open markets held in all ten towns in the bay, with fresh seafood and local produce the order of the day. Pick up some delicious fresh lettuce, radishes and tomatoes, juicy crevettes and crusty bread for a simple meal like no other, served up in the evening sun with a light white wine. For good local French food, try La Petite Maree in La Teste-de-Buch. This restaurant serves fruits de mer, fresh fish tartare, fish and chips, and chunky burgers for those who don't fancy the fish! For a celebration meal, head to Michelin-recommended La Guérinière in Gujan-Mestras. This is a fairly expensive place to eat, but chef Christophe Giradot creates stunning, delicious meals with an interesting mix of French and Asian influences. For a simple pizza in Le Teich, Lybia Pizza is a good option, while Brasserie is good for a glass of wine in the evening, and Le Central Café offers excellent value for money. Madame Vacances' Residence les Rives Marines offers apartments in the village of Le Teich in Bassin d'Arcachon. Sitting alongside Gujan-Mestras and Biganos, Le Teich is a bird lover's paradise. 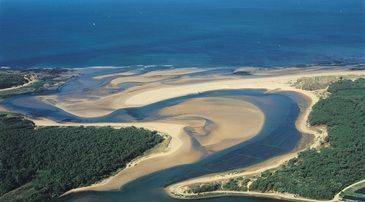 Our apartments are located on the banks of the bird sanctuary, 300m from the sandy beach and 15km from Arcachon. This residence is perfect for family and couples' holidays, with apartments alongside walking and cycling paths, 700m from the town centre, and driving distance of the rest of the bay. Each apartments is spacious, sleeping from two to eight people. Fully equipped kitchens make self-catering a dream, while bright living spaces and use of a communal swimming pool provide plenty of space for all guests.